No one wanted tariffs but Trump and a close puppet or two in his cabinet. Financial analysts from independent think tanks, and a clear majority of Congress has been trying to get him to back off on the arbitrary tariffs before our economy tailspins into another recession. Things are already getting bad for American farmers, a core base of Trump voters. In desperation Trump has proposed a bailout for them to help those already suffering from his tariff policies. Republican backlash is growing against the $12 billion dollar fix for his stupidity. "They've been taking the legs out from America's farmers and ranchers," Sen. Ben Sasse (R-Nebraska) said. "What the administration is offering is $12 billion in gold-plated crutches." "I just don't think tariffs are a smart way to go." - House speaker Paul Ryan. Tennessee Republican senator Bob Corker called on the Trump administration to "reverse course and end these incoherent tariffs," and said the administration was "offering welfare to farmers to solve a problem they themselves created." Trump is insisting it's not a bailout but a "short-term solution" until the trade disputes are solved. Facts always destroy rhetoric. 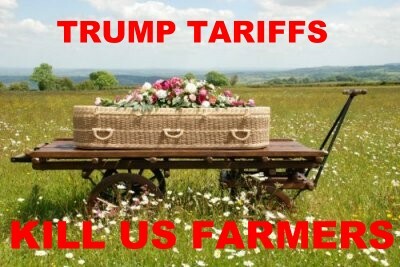 Farmers are going to pay the price for Trump's trade war in lost markets. That's a given. There's no timeline when things will be peachy-keen again. Perhaps more importantly, Trump has misjudged the farmer's re-action to his bailout. Most don't want anything that smacks of welfare. The question is will this 11th-hour bailout stop his base from deserting him in the mid-terms? It's obviously a stop-gap measure designed to temporarily quell a rebellion among Republican farmers. There is a section of Trump's base, the non-farmers, who will always stand beside him as he attacks every law and norm in the country. Even if they do turn out to support Trump's picks in the mid-terms they simply don't have the numbers. Every major poll in the country has pointed out that while Trump enjoys strong support from the Republican Party, the majority of Americans are opposed to nearly every policy Trump has forced upon our country. Come November, we'll see how many Trump supporters turn out for the mid-terms. If the Democrats turn out in the expected numbers, that will be the first step in re-taking a runaway government under a wannabe dictator. tariff policies have put farmers “in the poorhouse” and now his solution is to put them on welfare.